Crime Watch: Happy Birthday Nancy Drew! Wednesday 28 April marks the 80th birthday of one of the most famous and popular female heroines in literary history; teenaged amateur sleuth Nancy Drew. 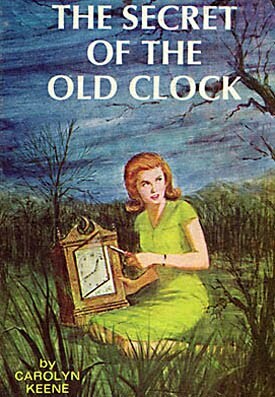 The very first three Nancy Drew mysteries, THE SECRET OF THE OLD CLOCK, THE HIDDEN STAIRCASE, and THE BUNGALOW MYSTERY, were all published on this day, way back in 1930. I remember reading and enjoying a couple of Nancy Drew mysteries when I was growing up, although (unsurprisingly) I was more a Hardy Boys fan - I read all of the Hardy Boys books I could get my hands on - my friends and I read dozens of them, from the school or public library, bought from the store or received as presents. In fact, when I was interviewing Linwood Barclay (NO TIME FOR GOODBYE, NEVER WALK AWAY etc) last year, I was reminded that it was the Hardy Boys stories that first sparked my interest in and passion for mystery, crime, and thriller fiction. Up until that point I'd always traced my adult love of crime fiction back to my adolescent and teenage reading of Sherlock Holmes and Agatha Christie's Poirot, but when Barclay mentioned the Hardy Boys tales as amongst his favourite childhood reading memories, I recalled that they too had been the first series of books I was really, really into (along with Asterix comics), back at primary (grade) school. It won't surprise many, but the Hardy Boys tales (by Franklin W. Dixon) and the Nancy Drew stories (by Carolyn Keene) were actually both created by the same publishing company, and in fact, many of the same writers. Both were created by Edward Stratemeyer, founder of the Stratemeyer Syndicate, and both were written under pseudonyms by a team of writers. The Stratemeyer Syndicate also created the Tom Swift series, the Bobbsey Twins books, and the Rover Boys. Without a doubt, Edward Stratemeyer and his team certainly did wonders for getting many, many people to love reading from a young age, over the past 100 years and more. For instance, the Rover Boys series alone (probably one of the lesser-known of the Syndicates series nowadays) sold more than 5 million copies between 1899 and 1926. That would still be a big number now, let alone then. In fact, it would be an interesting discussion about whether modern 'phenomenons' like Twilight, or the Harry Potter books are merely the recent versions of the type of widespread children and teenaged books embrace that Stratemeyer first created (up until his time, no one had focused on books for children and teens in that series manner). But, back to the birthday girl. Paraphrased from Wikipedia, Nancy Drew is an 18-year old amateur sleuth (she was 16 in the earlier versions) who lived in the fictional town of River Heights with her father Carson Drew (an attorney) and their housekeeper Hannah. Her mother dided when she was young (3 in modern versions, 10 in the older books). Nancy is often assisted in solving mysteries by her best friends Bess and George, and occasionally by her boyfriend Ned Nickerson. American novelist and literary critic Bobbie Ann Mason described Nancy Drew as "immaculate and self-possessed as a Miss America on tour... as cool as a Mata Hria and as sweet as Betty Crocker". Unsurprisingly, the Nancy Drew tales have been revised somewhat over the 80 years since they first began - and in fact there could be some great sociological insights into just how our culture has adapted and evolved over the decades (or not), when those revisions are examined. According to Wikipedia, "the books were extensively revised, beginning in 1959, largely to eliminate racist stereotypes, with arguable success. Many scholars agree that in the revision process, the heroine's original, outspoken character was toned down and made more docile, conventional, and demure. In the 1980s a new series was created, the Nancy Drew Files, which featured an older and more professional Nancy as well as romantic plots. In 2004 the original Nancy Drew Mystery Stories series, begun in 1930, was ended and a new series, Girl Detective, was launched, with an updated version of the character who drives a hybrid electric vehicle and uses a cell phone. Illustrations of the character have also evolved over time, from portrayals of a fearless, active young woman to a fearful or passive one." The books have sold more than 80 million copies over the years, and the character has starred in several films, television series, and a range of computer games. Not bad for an 80-year old, eh? To celebrate the occasion, The Poisoned Pen in Scottsdale, Arizona is holding a 'Nancy Drew 80th Birthday' event. You can find more information here. Hat tip to the always-excellent The Rap Sheet, for the heads-up. So, were/are you a Nancy Drew fan? A Hardy Boys fan? Did you read the books, watch the TV shows or movies, or play the computer games? Do you think the old stories still hold up now? What did you like/dislike about them? Thoughts and comment welcome. I read both Nancy Drew and the Hardy Boys books - devoured them really. I definitely wanted to be like Nancy - even to the point of investigating several 'crimes' in our local area with a friend. The case of the silver pen was our biggest success and something we still laugh about all these years later. In fact the reason we became friends was that we were the only two girls at our (admitedly small) school who read Nancy Drew and Hardy Boys books - all the other girls were reading 'girlie' things with princesses and wotnot which never appealed to me. I've no idea whether the stories I read would hold up now as I don't have any of the old books. I did buy some of the new Nancy Drew books for my niece and she loved them so I guess the character still has appeal at least. Oh my! I have the complete set (still) in the blue-cloth editions that I will never part with. When I was a kid I wanted to be Nancy Drew. My sister and I started our own little detective agency (LOL) and because my real name is Nancy, I was the person in charge. We solved the mystery of the neighbor's missing kitty (it was being tempted away from home by better food). Oh my gosh -- this is too funny remembering this stuff. I have to blame Nancy Drew for recent years when I used to have to know what was going on with my previous neighbors (the really bad ones),when my husband used to tease me about being "Nosy Nancy's detective agency." So I say ... Happy birthday,Nancy Drew, and long live Bess, George & Ned as well. They were my best buds growing up. Thanks immensely for the post! It brings back lots of good memories. Thanks for the post, I didn't know it was her birthday but I had a Nancy Drew book and movie post among my drafts and will post it in honor of the day. Happy Birthday, Nancy Drew! 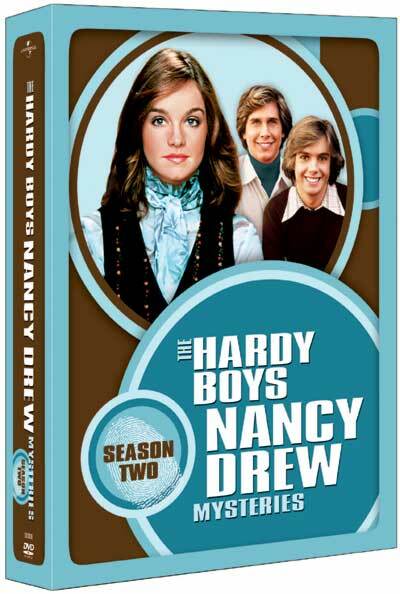 I have fond memories of spending hours reading the Nancy Drew and the Hardy Boys books. I would get lost in them and my mom had a hard time getting me to do anything! Oh yes! My mum had shelves and shelves of mystery books and I devoured them all many times over. Trixie Belden, Nancy Drew, Hardy Boys, Meg Mysteries and Susan Sand and others the name of which I can't recall right now. The Three Investigators were my favourite series though (and now my son's enjoying them too). And like you I progressed to Sherlock Holmes. Thanks for posting. Ah, the nostalgia!